^ Durant, S.; Mitchell, N.; Ipavec, A.; Groom, R. Acinonyx jubatus. The IUCN Red List of Threatened Species (IUCN). 2015, 2015: e.T219A50649567 [13 January 2018]. doi:10.2305/IUCN.UK.2015-4.RLTS.T219A50649567.en. ^ Namibia: Cheetah Conservation Fund Celebrates 25 Years. allAfrica.com. 20 March 2015 [6 April 2015]. ^ Acinonyx jubatus (Cheetah, Hunting Leopard). IUCNRedList.org. [6 April 2015]. ^ Ella Davies. Iran's endangered cheetahs are a unique subspecies. 24 January 2011 [6 April 2015]. 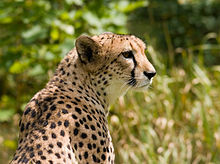 ^ Cheetah, Acinonyx jubatus. [6 April 2015]. Great Cats, Majestic Creatures of the Wild, ed. John Seidensticker, illus. Frank Knight, (Rodale Press, 1991), ISBN 0878579656. Cheetah, Katherine (or Kathrine) & Karl Ammann, Arco Pub, (1985), ISBN 0668062592.